Consciousness-Based Management is an approach to collective organisation which developed from the early 1970s onward through the introduction of Transcendental Meditation into corporations and educational institutions in all parts of the world. The theoretical foundation have been laid by reviewing the corresponding paradigms in modern physics resulting in Maharishis Absolute Theory of Management. The term ”absolute” refers to the integration of the quantum and classic paradigm into an unified approach to management, which when applied simultaneously strengths the alignment between the organization’s goals, the development of the individual and the needs of the environment. 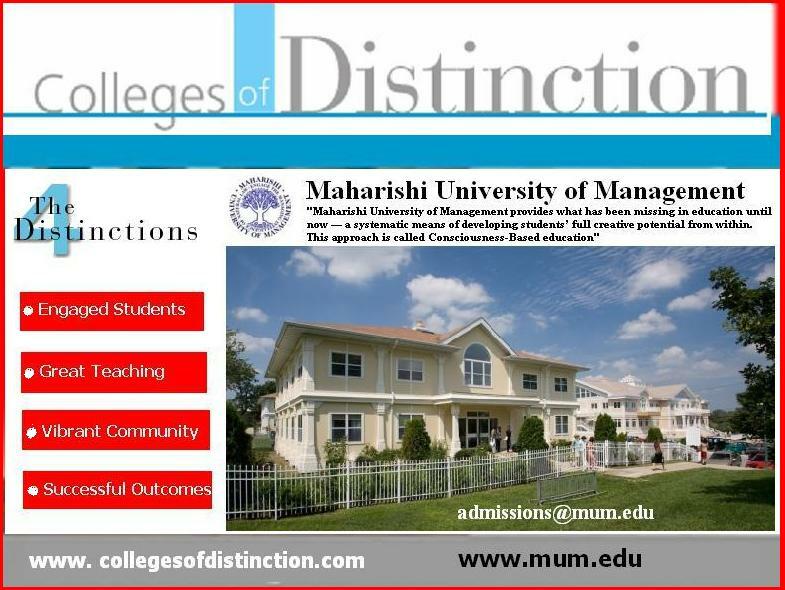 In USA the theory and application of Consciousness-Based Management and Education are the central themes of Maharishi University of Management founded 1973. The strategies taught for organizational development at MUM are based on the utilization of systematic, effective techniques for the development consciousness which have been introduced by Maharishi Mahesh Yogi. Extensive empirical research already has shown these techniques to develop the mental, physiological and social capacities of the individual. Head of the faculty of Business and Management at MUM is Dennis Heaton, Ed.D., Professor of Management. As co-director of the Ph.D. program in management he is directing research in areas of socially and environmentally responsible business, including the effects of green buildings on human resources, consumer attitudes toward genetically modified food, and the moral development and ethical decision-making in accountants. Recent graduates have also research topics such as Maharishi Mahesh Yogi’s program to eliminate poverty, and the financial impact of environmental management systems. Heaton, D. (2011). Transcendent experience and development of the post-representational Self. In A. Combs, A. Pfaffenberger, & P. W. Marko (Eds.). The postconventional personality: Perspectives on higher development. Albany, NY: SUNY Press. Heaton, D. P. & Kendz, S. (2008). Maharishi Mahesh Yogi’s contribution to management thought: engaging the managing intelligence of Natural Law. 2008 Proceedings of the Midwest Academy of Management. Heaton, D. P. (2008). An innovative model of management education for the poor: The South African experience. Journal of Management Education, 32 (6), 738-749. Special Issue: Management Education in the Context of Poverty. Heaton, D.P., Schmidt-Wilk, J. and Nwoah, S. K. (2008). Training graduate students to be great teachers: Experiences and outcomes. Proceedings of the 35th OBTC: Teaching Conference for Management Educators, June 11-14, 2008, Babson College in Wellesley, MA. Heaton, D. & Schmidt-Wilk, J. (2008) Leadership Development through Development of Consciousness. In G. Biberman and L. Tischler (Eds.). Spirituality in Business: Current Theory and Practice and Future Directions. London and New York: Palgrave Macmillan. Heaton, D. P. (2005). Harmonizing stability and change by enlivening creative intelligence. Management and Change (India). Chandler, H. M., Alexander, C. N., & Heaton, D. P. (2005). Transcendental Meditation and postconventional self development: A 10-year longitudinal study. Journal of Social Behavior and Personality, 17, 93-121. Steingard, D., Fitzgibbons, D., & Heaton, D. P. (2004). Exploring the frontiers of environmental management: A Natural Law based perspective. Journal of Human Values (India). Heaton, D. P. (2004). Human Resource Practices to Enhance Employee and Customer Satisfaction. CSS&CSSI Forum. (China). Heaton, D. P., Schmidt-Wilk, J. & Travis, F. (2004). Constructs, methods, and measures for researching spirituality in organizations. Journal of Organizational Change Management, 17 (1), 62-82. Special Issue: Organizations and Spiritual Values. Heaton, D. P. (2003). Assessing problem based learning in a business program. PBL Insight, 6 (1). Available online at www.samford.edu/pbl/PBLInsight6/. Heaton, D. P. & Harung, H. S. (2001). Awakening creative intelligence for peak performance: Reviving an Asian tradition. In J. Kidd, Xue Li, and F.-J. Richter (Eds. ), Human intelligence deployment in Asian business: The sixth generation project. London and New York: Palgrave. Heaton, D (2000). Holistic health for holistic management. In G. Biberman & M. Whitty (eds.) Work and Spirit: A Reader of New Spiritual Paradigms for Organizations. Scranton, PA: University of Scranton Press. Heaton, D., Schmidt-Wilk, J., & Langstaff, J. L.. (2000). Finding Spiritual Principles of Leading and Teaching in the Ancient Vedic Literature. 2000 Business Research Yearbook, Best Paper Presentations at the 2000 International Association of Business Disciplines, Los Vegas, April, 2000. Langstaff, J. L.. Schmidt-Wilk, J., & Heaton, D. (2000). Researching Spirituality in Organizations. 2000 Business Research Yearbook, Best Paper Presentations at the 2000 International Association of Business Disciplines, Los Vegas, April, 2000. Heaton, D. & Harung, H. (1999). The Vedic Management of Maharishi Mahesh Yogi: Enlightening human resources for holistic success. Chinmaya Management Review , III, 1, pp. 75-84. Heaton, D. & Harung, H. S. (1999). The conscious organization. The Learning Organization: An International Journal, 6, (4), 157-162. Heaton, D. (1999). The enlightened business of tomorrow. 1999 Business Research Yearbook, Best Paper Presentations at the 1999 International Association of Business Disciplines, Chicago, IL, March 25-28, 1999. Presently D. Heaton is also Dean of Distance Education and International Programs and is actively involved in establishing MUM programs around the globe, including consulting on the creation of eco-campuses in Africa. 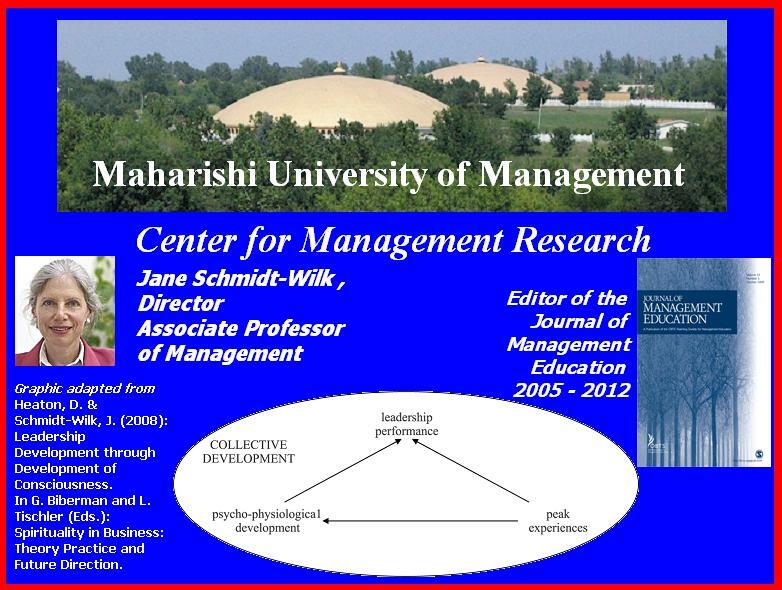 His wife Linda is Director of Sponsored Programs for the Maharishi University of Management Research Institute. Schmidt-Wilk, J. (2003). TQM and the Transcendental Meditation program in a Swedish top management team. The TQM Magazine, 15, 4, 219–229. Abstract Full text (PDF) Republished courtesy of Emerald. This article is not to be made available for re-sale, reprinting or any other commercial purposes without the specific permission of the publisher. Harung, H. S., Heaton, D. P., Graff, W. W., & Alexander, C. N. (1996). Peak performance and higher states of consciousness: A study of world-class performers. Journal of Managerial Psychology, 11, (4), 3–23. Schmidt-Wilk, J., Alexander, C. N., & Swanson, G. C. (1995). Introduction of the Transcendental Meditation program in a Norwegian top management team. In B. Glaser, (Ed. ), Grounded Theory: 1984-1994. (pp. 563–587). Mill Valley: CA: Sociology Press. Alexander, C. N., Rainforth, M. V., & Gelderloos, P. (1991) Transcendental Meditation. Self-actualization and psychological health: A conceptual overview and statistical meta-analysis. Journal of Social Behavior and Personality, 6, 5, 189-247. Haratani, T. & Henmi, T. (1990). Effects of Transcendental Meditation on mental health of industrial workers. Paper presented at 63rd Annual Meeting of Japan Association of Industrial Health, Japanese Journal of Industrial Health, 32, 7, 656. Haratani, T. & Henmi, T. (1990). Effects of Transcendental Meditation on health behavior of industrial workers. Paper presented at 49th Annual Meeting of Japan Society of Public Health, Japanese Journal of Public Health, 37, 10, 729. Frew, D. R. (1974). Transcendental Meditation and productivity. Academy of Management Journal, 17, 362–368. Steingard, D. S., Fitzgibbons, D.E., and Heaton, D. (2004). Exploring the Frontiers of Environmental Management: A Natural Law-based Perspective. Journal of Human Values, 10, 2, 79–97. Gustavsson, B. (2001). Towards a Transcendent Epistemology of Organizations: New Foundations for Organizational Change. Journal of Organizational Change Management, Special issue on New Paradigm Possibilities for Organizational Change Management, 14, 4, 352–378. Druhl, K., Langstaff, J., and Monson, N. (2001). Towards a Synthesis of the Classical and Quantum Paradigms: Vedic Science as a Holistic Approach to Organizational Change. Journal of Organizational Change Management, Special issue on New Paradigm Possibilities for Organizational Change Management, 14, 4, 379–407. Steingard, D. S. & Fitzgibbons, D.E. (2001). "Vedic Education as the Fulfillment of Postmodern Education: Consciousness, Meditation, and 'Heaven on Earth,'" Comportamento Organizacional E Gestao, 7(1), 125–129. Stevens, M. M. (2000). Introducing executives to the Transcendental Meditation program. In S. R. Cook-Greuter & Melvin E. Miller (Eds.) The Journal of Adult Development, A life of integrity and wisdom; A journal issue in honor of Charles (Skip) Alexander, 7 (4), 283–284. Harung, H. S., Alexander, C. N., & Heaton, D. P. (2000). A unified theory of leadership, Part I. Ledelse i Dag (Denmark), Summer. Harung, H. S., Alexander, C. N., & Heaton, D. P. (2000). A unified theory of leadership, Part II. Ledelse i Dag (Denmark), Fall. Harung, H. S., Alexander, C. N., and Heaton, D. (1999). Evolution of organizations in the new millennium. Leadership and Organization Development Journal, 20, (4), 198–206. Heaton, D. P. & Harung, H. S. (1999). The Vedic Management of Maharishi Mahesh Yogi: Enlightening human resources for holistic success. Chinmaya Management Review, III, 1 (issue on Spirituality at Work), pp. 75–84. Heaton, D. P. & Harung, H. S. (1999). The conscious organization. The Learning Organization: An International Journal, 6, (4), 157–162. King, Kurleigh D., Ph.D., and Scott R. Herriott, Ph.D. Beyond the current paradigm in management thought: Alignment with Natural Law through Maharishi Vedic Management. Modern Science and Vedic Science. Vol. 7, no. 1, 1997, pp. 225-237. Harung, H. S., Heaton, D. P., & Alexander, C. N. (1995). A unified theory of leadership: Experiences of higher states of consciousness in world-class leaders. Leadership and Organizational Development Journal, 16,(7), 44–59. Harung, H. S. (1995). Total management: integrating manager, managing and managed. Journal of Managerial Psychology, 11, 2, 4–21. Gustavsson, B., & Harung, H. S. (1994). Organizational learning based on transforming collective consciousness. Organizational Learning, 1(1), 33–40. Harung, H. S. (1994). More effective decisions through synergy of objective and subjective approaches. Management Decision, 31, 7, 38-45. Herriott, S. R. (1992). Maharishi’s Vedic Management. Management, 11, 5, 10–12. Baxter, M. J. (1992). A theory of consciousness as the basis of rational decision making and ethical behavior in business. Journal of Ethical Studies, 7, 221–229. Hagelin, J. & Herriott, S. R. (1991). Unified field based economics. Modern Science and Vedic Science, 4, (2) 72–95. Heaton, D. P. and Herron, R. E. (1988). Unified field based management: Research and theory. Modern Science and Vedic Science, 2, 2, Summer, pp. 222–240. Harung, H. S., Heaton, D. P., & Alexander, C. N. (1999). Achieving excellence through full development of human potential: From task-based, to process-based, to values-based in the twentieth century to consciousness-based in the twenty-first century. Proceedings of the Eleventh World Productivity Congress, Edinburgh, Scotland, October. Heaton, D. P. (1999). The enlightened business of tomorrow. 1999 Business Research Yearbook, Best Paper Presentations at the 1999 International Association of Business Disciplines, Chicago, IL, March 25–28. Harung, H. S., Alexander, C. N., & Heaton, D. P. (1999). As organizations evolve, what’s next? 1999 Business Research Yearbook, Best Paper Presentations at the 1999 International Association of Business Disciplines, Chicago, IL, March 25–28. Harung, H. S., Heaton, D. P., Graff, W., & Alexander, C. N. (1996). A preliminary investigation into the subjective states of peak performers. Proceedings of Midwest Academy of Management Conference, South Bend, IN, April. Harung, H. S., Heaton, D. P., Graff, W., & Alexander, C. N. (1995). Heightened awareness and peak performance. Proceedings of the Ninth World Productivity Congress, Istanbul, Turkey, May. Schmidt-Wilk, J. (1994). Developing corporate consciousness: A literature review on the Transcendental Meditation program in business. Proceedings of the 15th Annual IOOB Graduate Student Conference, Discovering Corporate Consciousness, DePaul University, Chicago, IL. March 4-6. pp. 135–136. Schmidt-Wilk, J. & Swanson, G. C. (1993). Creating a learning organization by developing the learner. In Thomas C. Head & Ralph Katerberg (Eds.) 1993 (36th Annual Meeting) . Proceedings of the Midwest Division, Academy of Management, Indianapolis, IN. April 15–17. pp. 119-120. Alexander, C. N., Swanson. G. & Heaton, D. P. (1990). The Transcendental Meditation program in two business settings. Proceedings of the Midwest Business Administration Association, Special Topics Division, Chicago, March 15, 1990. Schmidt-Wilk, J. & Heaton, D. P. (1990). Transforming human resources for the twenty-first century. in T. Head and K. R. Thompson, (Eds.) 1990 (33rd Annual Meeting) . Proceedings of the Midwest Division, Academy of Management, Milwaukee, WI. April 18–21. pp. 85-90. Herron, R. E., and W. W. Graff. (1990). The intelligence model of organizational effectiveness: Its implications for enhanced productivity. Proceedings of the 1990 Annual National Conference of the Association of Management, Orlando, FLA. pp. 286–290. Heaton, D. P. and Hoffman, J. W. (1989). The concept of collective consciousness. In R. G. Greenwood (Ed.), . Proceedings of the 1989 Conference of the Midwest Management Society, a Division of the Midwest Business Administration Association, Chicago, IL. Herron, R. E. (1989). Collective consciousness and organizational performance. In R. G. Greenwood (Ed.). Proceedings of the 1989 Conference of the Midwest Management Society, a Division of the Midwest Business Administration Association. Chicago, IL. Herriott, S. R. (1989). Issues in the definition of the collective consciousness of a corporation. In R. G. Greenwood (Ed. ), Proceedings of the 1989 Conference of the Midwest Management Society, a Division of the Midwest Business Administration Association. Chicago, IL. Schmidt-Wilk, J. and Fukami, C. (2011). Relevance With Rigor: Stories From the Journal of Management Education. In C. Wankel and R. DeFillippi (Eds.) Being and Becoming a Management Education Scholar, the. seventh volume in the Research in Management Education and Development series. Charlotte, NC: Information Age Publishing. Heaton, D.P., Schmidt-Wilk, J., & Travis. F. (2004). Constructs, Methods, and Measures for Researching Spirituality in Organizations. Journal of Organizational Change Management, Special issue on Researching Spirituality in Organizations, 17(1), 62–82. Schmidt-Wilk, J. (2003). TQM and the Transcendental Meditation program in a Swedish top management team. The TQM Magazine, 15, 4, 219-229. Schmidt-Wilk, J. (2000). Consciousness-Based Management Development: Case Studies of International Top Management Teams. Journal of Transnational Management Development, 5(3), 61-85. Schmidt-Wilk, J., Heaton, D. P., & Steingard. D. (2000). Higher Education for Higher Consciousness: Maharishi University of Management as a Model for Spirituality in Management Education. Journal of Management Education, Special Issue on Spirituality in Contemporary Work: Its Place, Space, and Role in Management Education, 25 (5), 580-611. Schmidt-Wilk, J., Alexander, C. N., & Swanson, G. C. (1996). Developing Consciousness in Organizations: The Transcendental Meditation program in Business. Journal of Business & Psychology, 10, (4), 429-444. Schmidt-Wilk, J., Alexander, C. N., & Swanson, G. C. (1995). Introduction of the Transcendental Meditation program in a Norwegian Top Management Team. In B. Glaser, (Ed. ), Grounded Theory: 1984–1994, (pp. 563–150; 587). Mill Valley: CA: Sociology Press. Schmidt-Wilk, J. & Swanson, G. C. (1993). Creating a Learning Organization by Developing the Learner. Proceedings of the Midwest Division, Academy of Management, Indianapolis, IN. (36th Annual Meeting) April 15-17. pp. 119-120. Harung, H. S., with Blank, W., Heaton, D., & Alexander, C. (1999). Invincible Leadership: Building Peak Performance Organizations by Harnessing the Unlimited Power of Consciousness. Fairfield, IA: MUM Press, 1999. Marcus, J. B. (1990). Success From Within: Discovering The Inner State That Creates Personal Fulfillment And Business Success. Fairfield: MIU Press. Swanson, G. & Oates, R. (1989). Enlightened Management: Building High Performance People. Fairfield: MIU Press. Letzte Änderung: 7 Jahre 11 Monate her von Dr. Bernd Zeiger. Transcendental Meditation is widely practiced by the industrial and governmental leaders of India. Recently Maharishi Corporate Development Programme has been introduced to the multinational giants of India, Tata Tea Ltd. and Tata Chemicals. 20,000 managers and employees of Tata Tea and 6,000 of Tata Chemicals have taken part in the programme. Other renowned companies enjoying the benefits of this unique programme include: Associated Cement, Indian Aluminum, Reckitt & Colman, Oriental Bank of Commerce, SRF, Eveready, Tata Unisys, BHEL, Jindal Polyester, Indian Petro Chemicals Ltd., Anand Group, DCM Shriram, Finolex, Hewlett Packard India, DCM Financial Services, Indian Sugar and General Engineering Corporation, SWIL, Williamson Magor and Co., and Kribhco. South India Research Institute Ltd.
South India Research Institute Ltd. (SIRIS) comprises 16 industries manufacturing basic chemicals, pharmaceuticals, pesticides and edible oils. A total of 3,000 employees are working in the SIRIS group of industries. A large majority of employees practice Transcendental Meditation. There is a need for the preservation and constant revitalization of the original creativity of the successful founders of family industries. The history of the decline of the original brilliance of family industries is due to lack of proper management training, which, focusing basically on economics, shadows the managing intelligence of Nature -- the Creative Intelligence in any individual -- and hampers the free and full expression of the evolutionary quality of consciousness. Not enough emphasis on the element of consciousness, the managing intelligence of each individual, results in the decline of health and creativity: a flower without water naturally fades. 1. The old order changeth. A recent survey of Indian business families shows that many of the most eminent names of a couple of decades ago are no longer at the top of the totem-pole. Among the dropouts are the Bangurs, the Kirloskars, the Modis, the Scindias, the Sarabhais, and ICI. 2. Some, like ICI and the Scindias, were victims of muddled management. These factors, and the lethargy evident in older groups, did play their part in the decline of business families. But the most important reason remains the tendency to fission given the slightest chance. Most groups when they reach the third generation have been carved up by the various family factions; even the Birlas had to go through such a division. In the west, by the time the third generation comes along, ownership gets divorced from management. In India, unfortunately, that does not happen. The third generation, with none of the talents of their entrepreneur grandfather, allow their companies to quickly go to seed. More interesting than looking at the dismal failures are the success stories. In 1976, the Ambanis of Reliance were a lowly 67th. Today, they not only preside over India's largest private sector company, they occupy the third spot as a group (after the Tatas and the BK-Aditya Birla combine). The Ruias (now No 4) were not even ranked in the earlier survey. R.P. Goenka (now No 6) was 60th. 4. The rise and fall of business families is of course as inevitable as the seasons. Fortunately for the rest of us, few of them are able to establish dynasties. One can be certain that many of today's leading names will vanish from tomorrow's league tables. Maharishi Corporate Development Programme has been established to save all companies and corporations in the world from decline. Through the programmes of Maharishi Corporate Development Programme there is no need for any rising industry today to be the falling industry of tomorrow. Now there is no reason why the original brilliance exemplified by the founder of any successful family company or any other company should fade over generations. A small percentage of profit spent on the welfare of the company -- to maintain the health, vitality, and creativity of the company -- will go a long way to ensure the ever-progressive performance and success of the company. 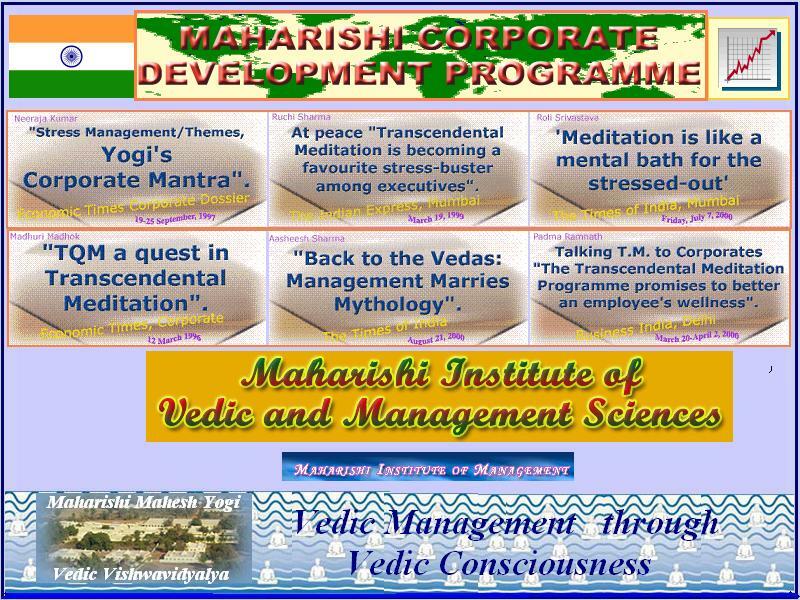 Maharishi Corporate Development Programme will maintain the vitality of the company by aligning the managing intelligence of the company with the ever-progressive, ever-evolutionary managing intelligence of Nature, ensuring that the company always continues to progress on the waves of success. Through the programmes of Maharishi Corporate Development Programme, the personnel department of the company will maintain good health, vitality, and creativity; the employer-employee relationship will be fulfilling to all, and the company will maintain progress without stress. The emphasis that is laid on the programmes of Maharishi Corporate Development Programme has its basis in Maharishi's reinterpretation and revival of Vedic Knowledge, and research in the field of consciousness, which is the most basic element of life, from where all areas of life are administered. Everything depends on the quality of management. Maharishi Institute of Management trains the manager to achieve rising levels of economy without allowing stress, strain, and problems to overshadow the life of anyone involved in the company. One major conclusion from the research findings on Consciousness-Based Management is the high effectiveness of the psycho-physiological approaches introduced by Maharishi Mahesh Yogi based on his revival of the ancient vedic wisdom of India. In modern India Consciousness-Based Management is called Vedic Management with Veda being understood as the Total Potential of Natural Law, comparable with the Unified Field of all the Laws of Nature glimpsed by modern physics. 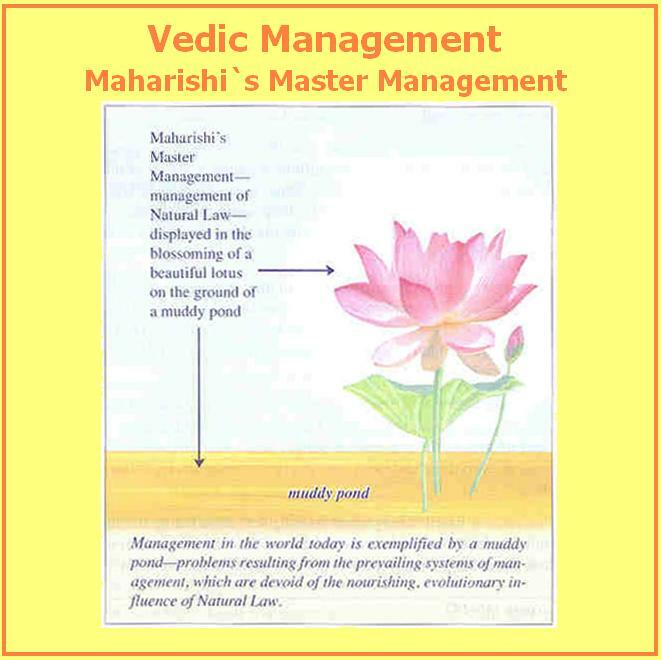 Vedic Management therefore aims at unfolding the organizing power of Natural Law in the awareness of the manager. (4) to maintain a state of health by balancing mind, body and environment. Because the Vedic Technologies already have passed the test of time to research them is not a topic in India but to apply them in an effective way by reviving their original complete status. The traditional consciousness-based management training was distorted by the foreign influence in India for thousand of years, and even now the momentum of foreign influence is dominating management systems in India, rendering them totally incomplete and ineffective. Human awareness is the element in business today which needs nourishment to become the source of future success in this age of global change. To harness the vast creative potential of human consciousness the total brain functioning has to be enlivened by scientifically proven technologies which optimizes decision-making, strengthen values, culture, and goals, create mind/body health, enhance efficiency and productivity, and increase creative problem-solving. MAHARISHI: ...Traditions are not built out of nothing. There is a great truth in the enhancement of life in all that the traditions speak to us. Older the tradition, better the truth. We are closer to the truth if we are closer to old, old traditions. Because anything that is untrue will not be accepted by nature for very long. Nature throws it off. The very continuance of certain principles, the very continuance of a principle, shows that principle is helpful to growth and evolution, it's helpful to life. It is helpful to progress tradition. Older the tradition, greater is the truth in it. Otherwise nature would throw it off. Because pure truth - truth is that which never changes - pure truth, Being, is absolute truth and that alone is infinite. Anything other than absolute truth is finite. It has finite values. It has variable character in it. Greater amount of truth has a more lasting value in time and space, lasts longer. That is the reason why all our traditions - forefathers and grand forefathers and all that - they have been telling us this, this, this. Because life is not new. We are not born for the first time on earth. Weed that grows is not growing for the first time. Oranges that grow, they are not a new creation of GOD. Apples that we find - every generations has been enjoying the apples. MAHARISHI: ...What we find is that the entire field of activity is emerging from knowledge and knowledge being one with consciousness - knowledge and consciousness. And the whole house of knowledge and knowledge, both are the same content. That is the spiritual content of life - unmanifest, absolute content of life. Knowledge is structured in consciousness and the evolution of knowledge to such an extent that the entirety of consciousness becomes the value of knowledge where the knower is the knowledge. And the physical basis of consciousness also becomes consciousness. The knowledge and the knower and knower in both aspects, consciousness and physiology - physical value and mental value. Both values, the knower and the knowledge, they become one. This is the total perspective of "knowledge is structured in consciousness". This whole picture of knowledge and its relationship with consciousness, if it sounds to be too fantastic this is because knowledge has not commonly been studied in terms of consciousness. As if the owner is devoid of home, knowledge was divorced from consciousness. And that is the reason why the total value of knowledge was never brought to light. The knowledge remained obscured when it was not studied in terms of consciousness. Knowledge failed to produce its fruit because the basis of knowledge, consciousness, was not fertilized or nourished. When consciousness is not nourished there is no basis for the fruit of knowledge to grow. And it is in this that the educational system continued to compromise with ignorance. All this specialization in one field and that is it and finished. So knowledge became a sort of locational means and not means to bring fulfillment to the natural urge for more and more knowledge which alone can be fulfilling to life. Letzte Änderung: 7 Jahre 10 Monate her von Dr. Bernd Zeiger. 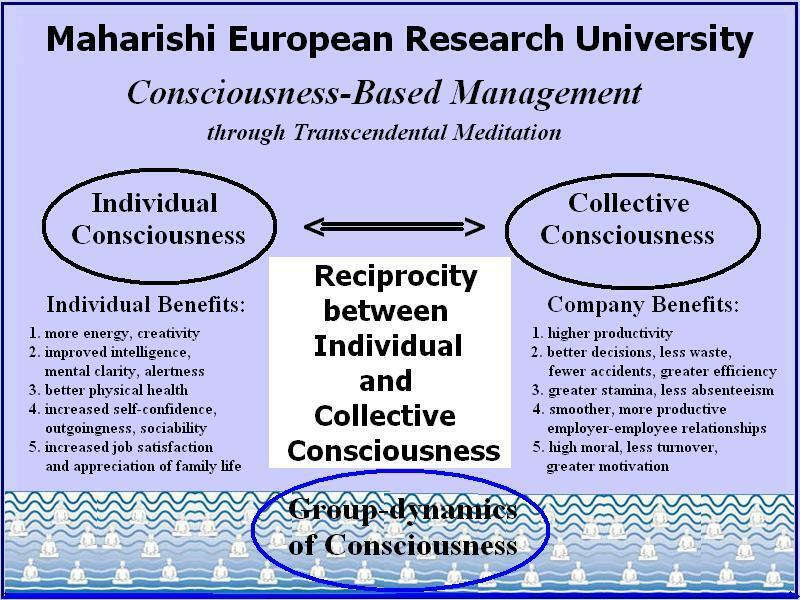 In Europe Consciousness-Based Management has been given a sound theoretical basis by Maharishi European Research University(MERU), Switzerland, founded 1975. Each area of life is considered in terms of the collective behaviour of the units that constitute it. For instance crime is being considered in terms of the collective behaviour of individuals of society and aging in terms of the collective behaviour of cells and other basic units in the human body. 2. damaging effect of routine work. 1.1 Advances in the knowledge of specific laws of nature through modern science have brought specific applications in industry by virtue of which the quality of living has been enhanced. However, due to the lack of knowledge of the total value of mnatural law, these advances have also produced imbalances in life, creating negative effects and also causiung damage and disturbance in the environment e.g. the danger of nuclear technology and genetic engineering. 1.2 Therefore it is vital that the knowledge and experience of the full value of natural law is introduced into the field of industry and technology. 1.3 To bring life in alliance with natural law, it is necessary to have the knowledge of natural law as a living reality in the field of consciousness, since activity is governed by consciousness in the same way that the classical level of reality is governed by the quantum mechanical level, the unmanifest field of infinite correlation. 1.4 The courses developed by MERU will introduce the theme of developing alliance with natural law, thereby ensuring that the activities of industry are in complete harmony with natural law, and bringing only befeficial and evolutiponary effects in human life and to the earth on which we live. 2.2 If the employer provides maintenance AND evolution of consciousness at the same time, the relationship between the employer and the employee will be more natural and mutually enriching, otherwise it will always remain a partial fulfilment of the relationship. Enlivenment of the full value of the relationship between employer and employee will spontaneously inspire the use of the full creative potential of the employees, which make their activity a direct means of full enlightenment. 2.3 On one side the employer should help the evolution of his employees on the other side the employees should have the opportunity to produce coherence through the group dynamics of consciousness, which is enriching to the evolution of the employer as well. This mutually enriching relationship is analogous to the relationship between parents and their children, between doctors and those for whose health they are responsible, and between government and the people. 2.4 The spiritual growth in the life of the employee will benefit the employer through increased creativity of the employees, which will improve productivity and at the same time decrease energy expenditure, fatigue and exhaustion in the employees. This will create industry where the routine work which is causing stress yesterday, becomes the means of enlightenment today. This will be the fruit of the knowledge of natural law. The assimilation of Consciousness-Based Management in various European countries has taken place via different approaches related to their cultural differences. In the German speaking countries with their traditional affinity to the vedic culture of India, Consciousness-Based Management has been mainly assimilated via the Ayurveda system of health care, becoming very popular since the mid 1980s. The success of ayurvedic health care in Germany has become a subject of sociological research at the Institute for World Society Studies, Faculty of Sociology, University of Bielefeld. 1. The German media and Maharishi health centres portray Ayurveda as a gentle, massage-based therapy. Maharishi designed an Ayurveda for the West concentrating on nutrition advices and on massages and oil applications (Stollberg 2001). Maharishi’s speciality is the Transcendental Meditation as Stress Management Program. 2. Regarding the patients ten out of the fourteen patients were female. Four of the fourteen participants were managers or business consultants. Half of the patients interviewed had a university degree. to see an Ayurvedic physician within three to six months after their complaints started, while others had been suffering for decades before they sought Ayurvedic help. To be guided by their physicians is more important to Ayurvedic patients than autonomy when it comes to their own health. Most patients appear to be perfectly content with a completely passive role in this respect. 3. Regarding the motives of the Ayurvedic physician to choose Ayurveda six of the fifteen Ayurvedic medical doctors interviewed reported that the attraction of Indian culture and philosophy paved the way for their Ayurvedic practice. Three of them studied Ayurvedic writings on their own, while three combined this approach with extended periods of practice in Ayurvedic hospitals in India. The physicians act as the gatekeepers of Ayurvedic knowledge to the patients , they introduce Ayurveda to them, choose the books, translate Ayurvedic terminology into terms their patients can understand. and they supervise the socialisation process whereby their patients become acquainted with Ayurveda. Health Care reform (Gesundheitsreform) is an ongoing topic in German federal politics. Already in 1978 a memorandum was presented to the Government of the Federal Republic of Germany pointing out the strategies to overcome the crisis in health management. This memorandum by the German Medical Association for the Promotion of Perfact Health through the Transcendental Meditation Programme (which in the 1980s became the German Ayurveda Society) comes to the conclusion, that the root cause of the modern crisis of health care is lack of knowledge of the natural laws which govern individual and collective life. 1.Development of consciousness should become a governmental task: A government department has to be set up for the development of consciousness in every section of society. 2.Public Education: All the available channels of communication should be utilized to inform the public of the health benefits of consciousness-based education. 3. Prevention: An effective prevention-oriented program of health promotion based on the use of Transcendental Meditation should be implemented. 4.Adjunct to Medical Treatment: Transcendental Meditation should become an adjunct to all forms of medical and surgical treatment, in psychiatric rehabilitation programs, and in alcohol and drug abuse clinics. 5. Criminal Rehabilitation: The many successful application of the TM program that have already been undertaken in prisons, should be takes as basis to accomplish criminal rehabilitation. 6.Education-System: Introduction of consciousness-based education at all levels of education : schools, universities, technical colleges, management training institutes, military training, and adult edication. 7.Industry: Transcendental Meditation should be introduced in industry to eliminate the stress and frustration born of routine work, to protect from the physical and mental wear and tear and to increase efficiency and productivity. 8. Administration:Increase the creativity and efficiency of government and administration by teaching TM to all elected representatives, public servants and executives. 9.Military Services: Introducing consciousness-based strategies in society to eliminate the building up of collective stress and national tension that leads to the outbreak of war: Elimination of the cause of war. 10.National Research Program: Implementation of a national research program to increase the knowledge how order is created in society by implementing the Transcendental Meditation program. 11. New Profession: The government should promote the profession of teacher of Transcendental Meditation. 12.Co-operation with Organization of TM-Teachers: The government should collaborate with the existing organisation of teachers of Transcendental Meditation. Founders Lothar Pirc and Karin Pirc, MD, PhD, have achieved remarkable success with the renowned Maharishi Ayurveda Health Centre in Bad Ems, Germany, since its opening nearly two decades ago; and they continue to expand Maharishi Ayurveda health programmes throughout the Western world. In 1992, the state government of Rheinland-Pfalz asked the couple to open a Maharishi Ayurveda Health Centre in the well-known Spa of Bad Ems, located in the former residential palace of the German Emperor, Kaiser Wilhelm I. Beginning with only 9 employees, the Center now has a staff of 80. Over 20,000 guests have received treatment at Bad Ems for chronic diseases; and more than 500 journalists have visited the Centre, resulting in 1,200 positive press articles plus hundreds of TV reports. Bad Ems has received 12 national and international awards, including the most recent which was awarded by a prestigious European guide to centres for relaxation treatment. According to Mr Pirc, 'This guide evaluated 1,400 hotels offering Ayurveda treatments in Europe, and stated that most of these facilities don't deserve to be labeled "Ayurveda". They chose only 20 centres, including Bad Ems, which they considered to have high quality treatments.' He added that the Centre consistently scores at the top level for good therapies, high quality oils, and good medicines. Also of note, Dr Karin Pirc has been included in the first edition of a Who's Who directory of European women, which features biographical information for 1,800 successful and prominent women of Europe. Dr Pirc is recognized for her 25 years of outstanding work in Maharishi Ayurveda, her leading role in expanding this health care modality throughout the Western world, and her personal contribution to the health of tens of thousands of people. In June 2010, Lothar and Dr Karin Pirc brought their expertise in management and medicine to the Maharishi Ayurveda Health Center in Lancaster, Massachusetts, USA, which was the first such centre established in the Western world, located in a beautiful area of 250 acres (101 hectares) of forest. Since then the Center in Lancaster has undergone significant renovations and a turnover in staff. Over 500 guests have received treatments for chronic disease since the Pircs' arrival, with outstanding results. Mr Pirc has also traveled throughout the US, Russia, Austria, Mexico, Belgium, and Canada, promoting the benefits of Maharishi Ayurveda in over 20 cities, and encouraging people to visit the centres in Bad Ems and Lancaster. 'This profession has brought me great fulfilment, and I hope to establish centres throughout the world,' commented Mr Pirc. Noch nie waren die Anforderungen an Führungskräfte aller Ebenen wegen der Komplexität der Aufgaben und Dynamik des Umfelds so hoch wie heute. Die volkswirtschaftlichen Kosten für die extreme Zunahme von psychosomatischen Krankheiten oder Leistungseinbußen durch Burnout Syndrom sind alarmierend. Fundiertes Fachwissen und die Beherrschung von Führungsinstrumenten allein genügen nicht mehr. Persönliche Faktoren wie Belastbarkeit bei gleichzeitiger Gelassenheit, Konzentrations- und Kommunikationsfähigkeit, Ausstrahlung und Souveränität, sowie Kreativität und Fähigkeit für Veränderungen rücken in den Vordergrund und sind für den Erfolg entscheidend. - Gesundung und Kräftigung des Körpers durch typgerechte Ernährung und Körpertraining durch das älteste Gesundheitssystem der Welt. - die Vorteile für das Unternehmen sind bei Training einer größeren Gruppe von Teilnehmern deutliche Reduzierung von Fehlzeiten, gesteigerte Produktivität, Entwicklung der Intuition und Verbesserung des Führungsverhaltens. Prof. Dr. Klaus Heilmann im Gespräch mit Dr. Ulrich Bauhofer, ärztlicher Direktor der ayurvedischen Klinik Parkschlösschen, Traben-Trabach, und Dietmar Penkwitt, Geschäftsführer des Speditionsunternehmens Schmalz & Schön, praktiziert TM und bietet sie für seine Mitarbeiter an. "Seit in meinem Unternehmen meditiert wird, sind meine Mitarbeiter wesentlich leistungsfähiger." "Ich meditiere nun seit etwa zwei Jahren und bin durch Zufall auf die Transzendentale Meditation gekommen. Unser Unternehmen, eine internationale Spedition mit heute über 500 Mitarbeitern, wurde vor 22 Jahren gegründet. In dieser Branche geht es immer sehr hektisch zu. Eines Tages stellte ich fest, dass mir die Kraft ausgeht, dass ich nicht mehr die gleiche Energie wie früher hatte." "Nach der Meditation habe ich anschließend wieder volle Kraft, bin ausgeglichener und kann mich auf das Wesentliche konzentrieren. Ich übe die TM zweimal täglich aus und komme nun nicht mehr in Stress-Situationen." "Nachdem es mir besser ging, merkten auch meine Mitarbeiter, dass ´der Chef besonnener reagiert und ausgeglichener ist`, und so ergab es sich, dass ich meinen 10 Abteilungsleitern anbot, auf Kosten der Firma die TM zu erlernen. Wir haben jetzt einen Meditationsraum in der Firma. Die Erfahrungen für das ganze Unternehmen sind sehr gut. Das Klima ist viel ausgeglichener." "Früher habe ich gegen meinen zu hohen Blutdruck zwei Tabletten am Tag nehmen müssen. Heute komme ich mit einer halben aus." Gibt es oder gab es noch andere deutsche Unterenehnen? vielleicht kennst du Roland Gleisner. Er war Geschäftführer des "Finanzdienstleisters" siehe www.lebensqualitaet-technologien.de/wirtschaft.html. Er wollte ein Buch darüber schreiben und wenigstens eine Video-DVD machen. Peak Performance Training in Sports and Business. Traditionally Norway is famous for its explorers e.g. Roald Amundsen, Thor Heyerdahl, Fridtjof Nansen (more at en.wikipedia.org/wiki/List_of_Norwegians#Exploration). Also Norway invented the sport of skiing, and the words ski and slalom are Norwegian. The Olympic Winter Games were first held in Oslo in 1952. Many famous athletes, sportsmen and -women are of Norwegian origin. The Norwegian Business Education is high ranking in Europe. The BI Norwegian Business School , Oslo is the second largest Management School in Europe and listed as one of Europe's 35 most influential international business schools (EDUNIVERSAL). regarded as one of the best and most attractive schools in Europe. Oslo University College (OUC) is the largest state university college in Norway, and offers the broadest portfolio of professional studies available in Norway. OUC was established 1994 when the Norwegian college system was restructured. 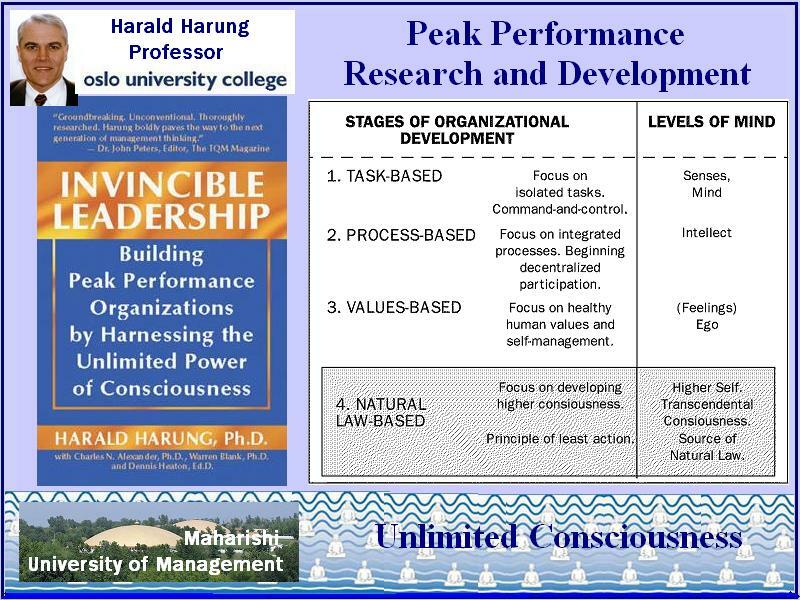 Harald S. Harung from Oslo University College, Faculty of Technology, Division of Management, intensively researched Consciousness-Based Management Development in collaboration with Maharishi University of Management, USA. Heaton, D. P. & Harung, H. S. (2001). Awakening creative intelligence for peak performance: Reviving an Asian tradition. In J. Kidd, Xue Li, and F.-J. Richter (Eds. ), Human intelligence deployment in Asian business: The sixth generation project. London and New York: Palgrave..
Harung, H. S., with Blank, W., Heaton, D., & Alexander, C. (1999). Invincible Leadership: Building Peak Performance Organizations by Harnessing the Unlimited Power of Consciousness. Fairfield, IA: MUMPress, 1999. Harung, H. S., Alexander, C.N., and Heaton, D. (1999). Evolution of Organizations in the New Millennium. Leadership and Organization Development Journal , 20 (3), 198-206. Harung H. S., Alexander, C.N. & Heaton, D. (1999). As organizations evolve, what’s next? 1999 Business Research Yearbook, Best Paper Presentations at the 1999 International Association of Business Disciplines, Chicago, IL, March 25-28, 1999. Harung, H. S., Heaton, D. Graff, W., and Alexander, C. (1996). Peak performance and higher states of consciousness. Journal of Managerial Psychology, 11, (5). ScienceDaily (May 5, 2011) — New research shows that musicians' brains are highly developed in a way that makes the musicians alert, interested in learning, disposed to see the whole picture, calm, and playful. The same traits have previously been found among world-class athletes, top-level managers, and individuals who practice transcendental meditation. Travis F, Harung HS, Lagrosen Y. (2011) Moral development, executive functioning, peak experiences and brain patterns in professional and amateur classical musicians: Interpreted in light of a Unified Theory of Performance. Abstract: This study compared professional and amateur classical musicians matched for age, gender, and education on reaction times during the Stroop color-word test, brainwaves during an auditory ERP task and during paired reaction-time tasks, responses on the Gibbs Sociomoral Reflection questionnaire, and self-reported frequencies of peak experiences. Professional musicians were characterized by: (1) lower color-word interference effects (Stroop task), (2) faster categorization of rare expected stimuli (P3b), and a trend for faster processing of rare unexpected stimuli (P3a), (3) higher scores on the Sociomoral Reflection questionnaire, and (4) more frequent peak experiences during rest, tasks, and sleep. Both groups had high values on the Brain Integration Scale. These findings are interpreted in light of a Unified Theory of Performance, which posits that effectiveness in any area is influenced by one's level of mind-brain development-emotional, cognitive, moral, ego and cortical development-with higher mind-brain development supporting greater effectiveness in any domain. Purpose – Today, there is a global need for more effective leaders. The purpose of this paper is to present a model of human development which covers the psychological, physiological, and sociological dimensions of leadership. Design/methodology/approach – The authors review three research studies in which they have investigated the relationships between consciousness, psycho-physiological integration, and leadership performance using physiological measures, psychological tests, and self-reports. Findings – These studies support the model that leadership ability is closely related to psycho-physiological refinement – the authors found that higher integration of the electrical brain activity, more mature moral reasoning, and more frequent peak experiences are found in top performers compared to average performers. Research limitations/implications – The high frequency of peak experiences among top performers reveals the importance of such gratifying inner experiences for the business community. Practical implications – The research suggests that practical methods for psycho-physiological refinement – such as the widely researched Transcendental Meditation technique – can be useful in developing more effective leadership. The brain integration scale presented here may be a reliable objective instrument for assessing an individual's leadership and performance capacity. Originality/value – A unique contribution of the authors' research is to recognize that integrity – an essential requisite for leadership – has a physiological counterpart in the integration seen in the functioning of the brain through electroencephalography. Abstract: Despite today’s accelerating rate and extent of change, the needed improvements within many areas of performance and quality of life have not taken place. Posits that productivity is remaining the same or even going down in many areas. Infers that learning and change have not been effective. Change involves a subject or self, who is acting, and an object which is acted on. Until now there has been an imbalanced focus on the object. In order to achieve more effective learning - through a synergy of objective and subjective approaches to change - suggests a comprehensive model of change where the emphasis is shifted from the object to the subject. In higher stages of human development, the subject increasingly experiences an enhanced capacity for accomplishment. Argues that this transformation of the actor provides the stable premiss for overcoming many of the shortcomings of contemporary learning and change strategies. In order to implement in practice the expanded change conception, introduces a mental technique - transcendental meditation - which systematically fosters human growth to higher stages of development, as shown by scientific research. a new revolution in business called “wikinomics” to realize the dream of being able to work and live together and even have our own business together with like-minded people. The wikinomics platform is a system where everybody contributes and supports each other to create economical value, and then distributes its profits amongst all participants and stakeholders. It creates something that is more than the sum of the parts, and is considered to become a bigger revolution than even the industrial revolution. An international team of young practitioneers of Transcendental Meditation started this project. In Fairfield, in collaboration with MUM summer 2011 the first six companies are being launched. In Europe the project is presented at the Guru Purnima Weekend from July 15 - 17 2011 at MERU, Holland. is explaining the concept in a simple way.